in a light dream of bees. More than that, Amsterdam gives Foley’s work an extra dimension, a novel backdrop of greater liberality. It is celebrated in ‘One for the Memory Palace’ as a place where grown men / ride battered pink bikes, hung with plastic flowers and where a child growing up might be in with a chance. 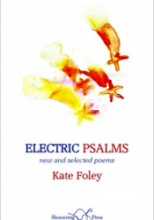 With a little over 160 pages of poems, Electric Psalms includes selections from all of Foley’s previous collections as well as a generous sheaf of new, uncollected poems towards the end of the book. This layout allows us to see the development of Foley’s poetry: not so much a radical change in style – on the evidence of this book, her poems seem to have always been solidly crafted – but a cementation of her work over the years and a slight change in outlook and approach, if not a mellowing. The earliest poems here, from 1994’s Soft Engineering are more intellectually spiky and restless compared to the recent ones in later pages. In her earlier work there seems to be a fascinating drive to destabilise domestic familiarity which gives rise to some startling imagery such as the killing edges of furniture in a house where a couple are arguing in ‘After the Visitors’; or where love is finger-printed with distance in ‘Enclosures’. Conversely, when a poem takes the reader far out of a domestic setting, Foley makes the horrific and unspeakable (such as the Holocaust) seem domestic, as in ‘A Visit to the Camp Museum’ where we are shown a lamp / with yellowing skin shade / somebody still / dusts it every day. as each cell settles on the branches of our sleep. I find the honesty and the refusal to euphemise in the excerpt above very moving, or in the poem ‘I Begin to Understand the Shape of Your Language’ where language curls up asleep in your mouth. / Did you know you snore in Dutch? Many of these poems are concerned with the movement of bodies through space / life, or an awareness of being confined. We see this in poems like ‘In the Frame’ where the gaze of a poet must be physically and domestically confined while at the same time it wants to venture far beyond the window frame. The most powerful meditation on space, freedom and confinement comes in the sequence ‘Fox Assisted Cure’ where a partially domesticated fox forms a kinship with a wheel-chair bound girl who is struggling to recover from a mystery illness – both are trapped in some way. The sequence ends with the fox returning to the wild: His what-next not for us to know. / His thanks was running. Foxes reappear in a number of Foley’s poems in incongruous domestic settings and seem to represent how irreconcilable human life is with wildlife, despite the repeated collision of the two.